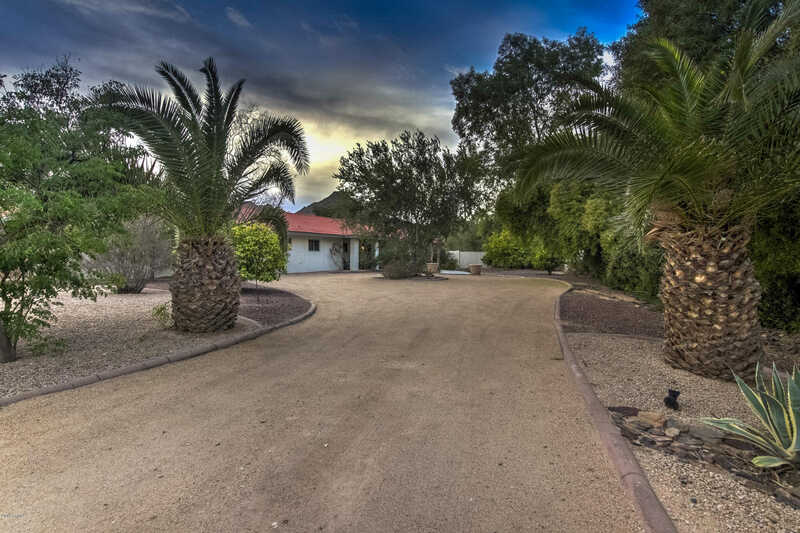 Expansive 1 acre + lot W/ breathtaking Views of Mummy Mountain. Backyard access through 2 RV Gates on either side of the house leading to a low maintenance, landscaped backyard W/ irrigation featuring a salt water pool & covered sunroom. Upon entering the double front doors, you will notice durable concrete floors throughout & an open dining room, large living area perfect for entertaining. The charming kitchen features exposed brick & gas stove. The kitchen is also equipped with double sinks, island, pantry, built-in desk & extra seating at the high-top peninsula. The living room includes one of two fireplaces with custom shiplap surround and shelving and a beautiful wet bar. Walk down the hall to a 1/2 bathroom. The storage in this house is endless! 3 car detached garage with HVAC. Approximate size: 46888.00 sq. ft.